What is an interpretive framework? incorporates the views of those likely to be affected. A significant outcome of the Science Teacher Education Partnerships with Schools (STEPS) Project is the creation of an Interpretive Framework designed to guide and inform the partnerships between universities and schools that support science teacher education programs. It is being developed from the case study data, informed by the educational research literature and is designed to help support judgments about current practice, and provide a framework for initiating practice. Embedded within a partnership between university and schools. A commitment to quality science education. Science teacher educator plays an active role in supporting the pre-service teacher in school settings. Science teacher educator and pre-service teacher practice is informed by pedagogical and learning theories. Interaction between pre-service teachers and children is integral to a science-related unit. Involve planning, implementing and assessment of a learning sequence in science. Reflection on and articulation of practice that focuses on pre-service teacher development and identity, and children's learning. 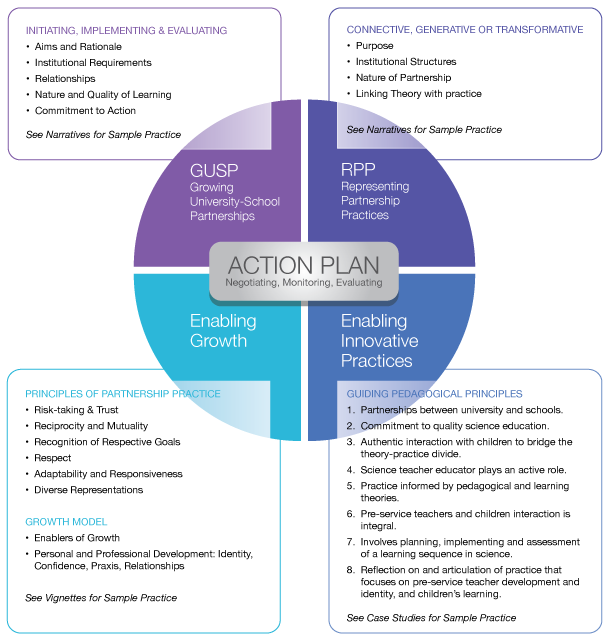 The GUSP describes the phases of initiating, implementing and evaluating school-based teacher education. The descriptions have been derived through analysis of the practices of 5 existing or past examples of this practice. Five Components are used in the GUSP to describe the likely processes and thinking required at each phase of development. While the development from initiation to evaluation appears to be linear for each component, these types of processes are iterative and must remain responsive to the needs of all key stakeholders, which might mean starting again at another school if a previous school is no longer available, for example. Whether initiating, implementing or evaluating a university-school partnership, the needs of each partner and their respective reason for being involved in the partnership need to be considered. Identifying needs and rationale ensures that each partner’s core requirements are accounted for in the establishment of a partnership arrangement. In effective partnerships, partners regularly check with one another in the implementation phase to ensure that each others’ needs are being met, and where possible, are flexible in arrangements to meet emergent needs that may not have been apparent in the initiation phase. In the evaluation phase each partner should review ways in which arrangements did and did not meet their respective needs and adjust the partnership arrangement accordingly for future iterations. Both universities and schools have a range of constraints that may shape the way in which a partnership can be organised. Aspects such as timetabling, curriculum and resources, to name a few, may limit the extent of the partnership arrangement. Each organization should try to identify as many constraints and affordances as possible to ensure the success of a partnership. Partners should also be prepared to respond, if possible, to changing constraints if and when they become apparent during the partnership implementation periods. The evaluation phase also allows for changing or emergent constraints to be better planned for in further partnership iterations. An essential aspect of initiating a partnership arrangement is to define the type of partnership that is desired/possible. Defining the nature of the partnership means considering the role each person is wanting and able to commit. Partnerships can be connective, generative or transformative. Each of these types of partnership is valuable in its own right, but provides different opportunities for the level of partners’ involvement before, during and after the partnership period. Table 2 (Representations of Partnership Practices) explores the nature and extent of partner roles in more detail. In evaluating the nature of the partnership, each partner can reconsider their level of involvement and maintain similar or negotiate different levels of involvement for future iterations. The nature and the quality of the learning arising from pre-service teachers’ interaction with children is the core purpose of the partnership. Here, the learning experiences of the children are of fundamental concern. Thus careful planning of the types of learning experiences - ways in which subject and general content and pedagogy is implemented – is essential. The other stakeholders also stand to learn from their involvement in the partnership; the degree to which this is planned for will depend on the type of partnership. Learning is informed by educational research, particularly related to science education and effective teacher practice. Involvement of the different stakeholders in planning and implementation of the learning experience can depend on the nature of the partnership that has been negotiated. In evaluating these interactions, both partners consider the experience of the children, the pre-service teachers, classroom teachers, and teacher educators, and how educational research can inform the most effective experience possible. Commitment to action emphasises that the various partners generate common understanding of what they are committing to. When a lead partner initiates contact there is careful consideration to how contact is made and the process of entering into a partnership. Negotiation requires discussion about the aims and rationale for involvement, requirements, constraints, enablers, type of relationship desired, and learning outcomes to be achieved. During implementation, all partners monitor and reflect on current levels of commitment and involvement. This ensures that aims and rationale, institutional requirements, and learning needs are consistent with the practices occurring within the partnership. There is scope to shift practice as the partnership progresses. Evaluation occurs at a time when it is possible to respond with change as necessary, such as at the end of a year or after completion of an iteration of the partnership practice. Evaluation is informed by data. Sustainability of the practice depends on continued common understanding of what each partner is committing to. The tools consist of sets of questions to guide thinking. They can be used in association with the other parts of the Interpretive Framework. The RPP depicts a typology of practices. These types—described as Connective, Generative and Transformative—are based on the nature of the purposes, embeddedness within the partner institutional structures, nature of the partnership as collaborative or cooperative, and extent to which links between theory and practice results in reflection on practice and professional identity development for the various partnership stakeholders. The table is not described to be value-laden, but represents differing types of practices, each with its own value and arising out of the desired purposes and educational outcomes, rather than as a trajectory that a partnership must move through in order to reach maturity. Again, the descriptions in each cell have been derived through analysis of the practices of 5 existing or past examples of this practice. The rationale for partners, and in particular, schools, for participating in the school-based partnership. The structures that exist within each institution and how they are managed and/or adapted to facilitate the school-university partnership. The level of co-operation or collaboration between partners to service a need or engage in joint effort and commitment to partnership outcomes. The level of involvement of each partner in reflection on theory and practice and opportunities for professional identity development. Connective partnerships are co-operative in nature. They are typified by a “win-win” outcome where each partner recognizes a key benefit/value from working together. They arise when one or other of the partners may have a particular need and the other is able to provide a space or service to accommodate that need. These partnerships sit within existing structures and tend to be “one-off” or short-term in nature. They are provided because both partners recognize schools as important sites for pre-service teachers to link theory and practice. These partnerships meet important short-term needs and provide seeding opportunities for other partnerships and/or more long-term generative or transformative partnerships. Generative partnerships, whilst still mainly co-operative in nature, see a greater level of commitment and participation from both partners. These partnerships generate new or different practices and outlooks in the school and university programs by committing to longer-term involvement in the partnership arrangement due to the recognised mutual benefits. Partners respond to one another’s needs to develop programs that may involve small modifications to existing structures in order to accommodate one another’s needs. Pre-service teachers are engaged in reflection on their practice where they make links to underpinning theoretical ideas. Teachers are cognizant of what pre-service teacher are doing in the classroom and this provides opportunities for them to also reflect on practice that may be linked to theory. These partnerships meet important long-term needs and are well-established in both the school and university planning. Transformative partnerships are collaborative and focused on active involvement in planning and delivery of curriculum for the purpose of professional learning. They are on going and embedded in the programs of the collaborating institutions. Partners have an invested interest in working collaboratively to develop key practices and outcomes that are aligned with and fundamental to their teaching and professional learning. Partners engage in critical reflective practice that is guided by theory-practice nexus and over time develops a sense of professional identity forged through their collaborative experience. Principals saw a strategic advantage for their schools from their involvement in the science program. Teachers understood the value that science offers to enrich the curriculum. We would hope that an increase interest in science results. In the case of the individual teacher – an increased confidence in teaching science in her class. Science is a priority in 2007. Science enables us to teach inquiry thinking. Science is a way to lead boys into literacy. Science can offer hands-on experiences for children. It enables engagement and caters for a wide range of preferred learning styles. Literacy and numeracy can also be taught through science. In setting up any program, there will be a range of requirements that affect the nature of what can be set up. For example, for the university the program might be embedded within core units/ courses (RMIT, Deakin, ACU models), elective units (UTAS) or clinical arrangements (Melb Uni). Working within the given constraints for all parties, requires negotiation and some compromises. The Teacher fellow and the Clinical Specialist seek to find a class teacher who can be a Mentor teacher and who is teaching science in their class planner in term one and two. This is difficult because schools tend to design for a term focus and our university semester cuts across two terms. Our Teacher Candidates are finishing their teaching before the end of term two. This has created issues for our Teacher Candidates and why sometimes the Mentor teacher will provide a small group of students to the Teacher Candidate. The partnership component of the school-based arrangement increased in importance and was more deliberately and carefully incorporated into planning and implementation of the unit. My own interest and rationale for the unit definitely moved from a predominantly pre-service teacher focus to be more considerate of the partnership element and the outcomes for the school partners alongside the outcomes for RMIT and its students. The significance of the partner schools’ requirements meant that each iteration of the unit was slightly different and was adapted to accommodate particular school conditions. The importance in planning the partnership arrangement and clearly discussing the needs of each partner in the beginning sets the stage for constructing an equal relationship. Furthermore, this builds the foundation of trust needed as university and primary school staff work together in the classroom. I think good communication and the opportunity to talk about it first, to say okay. I think there has to be something in it for both of us. All parties need to be aware of the learning they hope will result from their involvement. At the outset, some teachers were aware of the need to do science, but were unsure how to go about it. The program gave them an avenue to include science. Pre-service teachers had encountered the theory, but the classroom experience gave them an opportunity to apply it and reflect on what happened. There are lots of clever experiments out there however I lack the understanding to be able to quickly relate these to real life situations and concepts. Effective teacher questioning is mindful of the purpose and the context. This is something that I discovered to be important in my lesson today. Through reading the literature I have learnt that you should make sure that you allow adequate thinking time for high-order questions, you should always attempt to respond positively and constructively to an answer, should use questions to challenge, extend thinking and raise curiosity, and you should plan questions before the lesson. I did plan the question before the lesson and had thought about the fact that some students may not understand the word ‘justify’ and so I was prepared for this situation. Through reflection I have come to realise the importance and place of questioning in the classroom. Formative assessment should highlight the student’s weaknesses and strengths, this feedback has the ability to both motivate and direct students’ future learning (Earl, 2003). This feedback is designed to improve the students learning and to allow the teacher to analyse the students learning and in doing so find any concept areas that need further reinforcement (Wiliam, 2005). With this in mind I have given the students reasonably detailed feedback that explicitly points out the parts of their science journal that have been completed successfully, the parts that need some improvement and how this improvement can be achieved. After the initial discussion, the program moves into action mode and all participants should be clear on their role and have input to the plan. In this case the science educator organised an information session where teachers came to the university were briefed on the program and met their pre-service teachers for the first time. This was supported by the education department who provided time release for the teachers to attend. After speaking to Ceri (colleague teacher) I noticed that we were on the same level. That she wasn’t exactly sure how we were going to implement this topic in her classroom. I noticed that there were 17 boys and 6 girls in the classroom, this I would have to keep in mind if organising any groups. I felt relieved that we were both starting a project from scratch, as I was used to working with teachers who had already implemented class lessons that they knew worked. This turned out to be a valuable planning session were for two hours I felt that I was actively contributing ideas that were being taken seriously and listened to by a colleague teacher. I am starting to feel at this point that I am taken seriously as a teaching practitioner. Now that Jennifer and I have a bare skeleton of a framework to work off, I just need to add the meat to give it more form. I feel that Jennifer is taking this project seriously and her professional attitude towards me reflects this as I feel that I am seen as an equal, a colleague, not as just a university student. Prior to meeting my colleague teacher I was nervous and concerned about how she world perceive me. I took a proactive course of action to demonstrate my professionalism by coming to the meeting prepared with a concept for exploration and an outline for the six lesson sequence. I also prepared questions about her teaching career, level of confidence with teaching science and about the learners in her classroom. I genuinely think that she appreciated this approach., therefore, I will continue to take a proactive approach to our working relationship. I explained that I had begun planning in advance but that I would be prepared to alter these plans if she was committed to a different concept. Billie (colleague teacher) said that she had considered looking at ecosystems but she encouraged me to share my planning and ideas. She liked my ideas and, she was happy to run with them. She also offered some ideas for a second lesson within the explore phase of my sequence. We also consulted my lecturer about ideas for this session. The needs of the schools, universities and pre-service teachers should be catered for in the implementation of the program e.g. the close working relationship between schools and Melbourne University require universities to be aware of the needs of the school; and for schools to be aware of the rationale of the science program. When there is mutual understanding, pre-service teachers are able to move between university and school seamlessly. The demands placed on student-teachers provided the impetus for them to work together in a professional manner. The challenges associated with both curricular design and enacting the curriculum unit in schools was beyond the capability of even our best student teachers, if attempted alone. However, the team atmosphere, coupled with mentor and university staff support provides the opportunities for success. They were great by the end they all learnt off each other and worked as a team. That’s what’s good about the program too is that it shows our students down here that it’s important to work as a team right through the line. Even though you’re teaching science so many other concepts and values have been taught at the same time which is really important and so to see them working as a group makes it easier for our students to go off and continue work as a group. Maybe there’s that team environment that the pre-service teachers create. Maybe there’s a sense of almost a safety net for them so that helps them with the way that they conduct their lesson I would say as opposed to being isolated on your own. Teachers appreciate the forward planning and managerial skills of the academic ensuring that aspects of the placement have been discussed and considered. The academic has communicated with teachers and identified resources, and begun to identify students learning needs. Students appreciate the preparation and the on-going support during the placement. So at the school’s end they’ve got to be committed, they’ve got at least acknowledge it and want to do it. From the University end the university has to put in place or has to have in place the administrative support which I’m not sure is there. The Lecturer has got to know what they’re doing and I have no doubt Mellita knows exactly what she’s doing. As I say we had a group of four so that was good and we had Mellita come out and she watched what was going on and checked up on us and we knew we had her support the whole way through so that was really good. The school that we were partnered with was fantastic and they were really obviously very encouraging of pre-service teachers and that relationship with us, they were really helpful in themselves. So it was a really positive partnership. Staff and pre-service teachers spent considerable time researching and planning inquiry approaches in content areas assigned by partner schools. This led to productive classroom approaches where veteran teachers also found they were learning both content and pedagogy. The enthusiasm of the student teachers and their ability to spend considerable time thinking about and developing classroom ideas afforded them the confidence to try difficult approaches that they may not have attempted on their own. The science educator was able to provide pedagogical support and the pre-service teachers were able to discuss aspects of the learning with their colleague teacher. Our students the enthusiasm and the input from numerous minds into a single lesson creates a very productive dynamic experience for the children. Exactly just even like classroom management techniques and ways of presenting information. I probably wouldn’t have thought to do those energy chains I would probably have done it a little bit differently. [My science educator suggested] a hands on activity to explain habitats so that students could understand the idea of pond habitats more easily. I was troubled as to how I would be able to do this without access to a pond nearby. A few activities were offered as a solution, one of which involved doing a bug survey as to how many bugs lived in a particular area of the play ground. Even though this was not a pond exercise, it still highlighted that bugs lived in different areas of the playground, and that different habitats where made up of different insects. I reflected on my last lesson and looked over what I needed to do so that I wouldn’t lose the class during my activities. I planned to face my class equipped with work sheets that had clearly spelt out what I required my students to do for the day. I decided that for this lesson I would put all the items the students need for the investigation in a kit and place it under their table groups. I thought this way they would not notice it and I would save time and most of all it would not be as distracting as placing it on their desks. But I was wrong because the minute the students walked into the class from lunch the first thing they noticed was the kits! So they did get distracted and they did open the kits and got all the materials out which I did not want to happen. I asked Clarissa (colleague teacher) how she would have handled the materials and she said the best thing would have been to hand them one at a time. This makes sense because after investigating each item I could have collected it and gave the next item and this way they would not have all the materials on their desks to distract them. This would have also prevented me from repeating myself and asking them to stop playing with the materials so many times. An interesting aspect of the partnership was that veteran teachers were asked to observe and provide feedback to student teachers. An unintended consequence of this task was that it provided those veteran teachers with an opportunity to reflect on their practice. Often they saw their students’ positive reactions to inquiry-based pedagogy and high levels of engagement. In turn, teachers reflected on their desires for wanting to add more of those elements into their own classroom practices. I was really pleased with their level of engagement with the kids that they’d got to know their names pretty quickly because they were only here for four or five sessions and they knew their names. They worked well with the kids, they were organised, they had really exciting things for the kids to do, stuff that I’d never done before because we don’t really have the access to the chemicals and stuff to be able to do like all that foamy stuff, that was good, I enjoyed that and the kids loved it they were really engaged with it. Every year there needs to be evaluation of the program. Is it meeting the needs of the universities, schools and pre-service teachers, and is the rationale still justifiable within the school and university contexts? Evaluation must take into account feedback from pre-service teachers, schools, as well as responding to institutional changes. While the needs and rationale may be the same, institutional changes may require a shift in how the experience is conceptualized. This year to cater for the demand and in response to pre-service teacher feedback that the experience still isn’t authentic because they worked in such large groups, I have had them planning and teaching in pairs, with a few on their own. The partnership component of the school-based arrangement increased in importance and was more deliberately and carefully incorporated into planning and implementation of the unit. The school-based science sessions continue because principals and teachers in schools, academics and pre-service teachers all consider them to be important in the teaching and learning of science and learning to teach science. Further they provide opportunities to foster an appreciation of science in all participants and professional learning for the teachers in the schools. Conversations with teachers at the school indicate their enthusiasm for the sessions, commenting that their children are highly motivated by the experience. The unit is shifting to 4th year, trimester two, which will make this a capstone unit and need to focus more on teacher readiness. I envisage greater interaction between teachers and the students through planning and feedback meetings, although this will need to be valued by the teachers, and may lead to organisational complications. Aligning student units with the school’s curriculum directions might promote greater linking between learning experiences offered by the pre-service teacher and classroom teacher, thus greater valuing of the pre-service teacher involvement at the school. Programs have a way of changing over time as needs change or possibilities present themselves. In response to feedback and requests from schools, Deakin’s program has shifted from giving pre-service teachers an open choice for topics, to developing topics that fit in with the school’s theme or inquiry. Managing this from a partnership point of view would take some planning I guess. I see pre-service teachers working with our students in small groups, working on earth sciences, I saw a group working on water, another group solar power, etc. I’m wondering if there’s a way of negotiating with Deakin so that the work that the pre-service teachers are doing links to our integrated studies planner so that the work … extends or supports the other scientific enquiry that’s happening at the same time…” “I think there’d be some benefit if there was some sort of feedback or discussion at some point throughout the program that involved the classroom teachers, to talk about what the students were doing what they were observing and then feed that into the classroom teacher and have some discussion. There is often a perception that partnership programs are usually designed for the sole benefit of the university. Our partner schools counter this assumption and clearly articulate the benefits of working with RMIT students teachers. These benefits include recruiting future staff members, strengthening the school science program and promoting the school within the community. I see that there’ve been real advantages, for a start we’ve employed a staff member out of it, so one of your trainee teachers impressed us.’... ‘Yes we try to be as accommodating as we can be because we see real benefit in this partnership as I said it’s a win/win for us all. I hope that’s your perception as well. We’re a small school we need to get our name out there with the programs that we’re doing so we’re happy to have the relationship between RMIT and us out there and known through the community. I talk about it regularly at School Council, it’s promoted through there when we do our school tours, either Lance or I depending on who’s taking the tours, we talk about our science program, we talk about our link to RMIT as well we think it’s fantastic. Teachers were able to take away valuable science teaching ideas and improve their science knowledge and practice. Pre-service teachers gained valuable insights into the importance of science pedagogies and the practicalities associated with their implementation in the classroom. It really engages the pupils. I learnt concepts about pulleys and levers that I didn’t know about before.- so I will probably use these again if I ever work on this topic again. I have actually done more science this year than I ever have before…I can see where it fits now. So… I can take a literacy idea or a SOSE idea and you can bring all your science activities into it … I’ve really enjoyed it. “Yes” (I am more confident than before the project)…And I have seen the children… because I can step back while she is doing the lesson I actually can watch the children and see the enjoyment and it is allowing them to think of possibilities and question things and I like that because I like the kids to think. After observing the change in behaviour and engagement in the students from when they were simply doing reading and writing exercises to doing hands on activities highlights the benefit of providing students with hands-on, authentic tasks to motivate them to learn. Hands-on learning and learning through experience are powerful tools to ensure students are actively engaged in their learning which in turn supports true understanding and learning (Rutherford cited in Haury & Rillero, 1994). …Solid organisation of lessons and resources and clear instructions to students will help to ensure a successful hands-on science lesson in which all students can learn and engage. Supporting the students through their exploration with guiding questions and prompting will help students make connections with existing knowledge and help them create new understandings. Hands-on lessons should not be something that is shied away from by the teacher due to lack of experience or confidence, it can be used as an opportunity to learn with the students and increase confidence for future lessons and efforts will be rewarded with happy students who want to learn. The programs improved iteratively. Participants provided feedback and suggested how the program could be made more effective. It was a really positive experience for myself personally and I think our group at large, I don’t know I guess in an ideal world maybe gone in and visited the school prior to starting, we might have had a better understanding of what their classroom set up was like, but that’s okay you won’t always know what. As stated above being able to see and support each others practice would have been beneficial. Also it is always difficult planning when you don't know the school or children. I would recommend a pre-visit to the school before the plan gets written. To be honest there were some parts I was clear about and others I wasn’t. I didn’t know if I was supposed to teach more and assist less, but it worked anyway. Partnership (should) extend over a longer period, possibly as a precursor to the student’s 4th year school experience with the same group of students and teacher. Thank you for the opportunity. My students really enjoyed working with their student “science teacher” and I hope that the program will continue to grow. In response to communication problems, for the next iteration I negotiated for teacher participants to get half a day release from class to attend a session at the university. In this case they could be briefed about their role face to face, meet with their pre-service teacher and begin planning what they want to teach. It was well received and much more effective. Schools recognize the value that the program can have for them in raising the presence of science in the school, links to academic institutions, and assisting the school to meet its obligations to teach science. The pre-service teachers bring new teaching ideas and practices, and model the teaching of science to teachers who may lack confidence in their own science teaching. Absolutely yes it’s good for the school, it’s nice for us to be able to put in the newsletter that we’re in partnership with Deakin Uni and there’s a science program happening here and we’re working with pre-service teachers and that looks good for the school. It’s also good to us as a receiving thing because we’re not great science teachers and the more time kids get with science the better. So it’s a win/win for us, we like being involved. We do teach science but the bulk of our science curriculum is done through Deakin… It’s a bit like the swimming program not as intense and not as regular and that’s why we love the Deakin program. It focuses us, teachers will follow on and finish off lessons that may have been started by the Deakin Science. There’s often times when Deakin Science practicals will peak an interest in the students and the teacher especially when we’re doing things like Space or there’s a cooking theme happening the science really couches in. So it’s a real win/win I guess. Teachers and pre-service teachers relished the opportunity to work together. Teachers valued another professional working as a source of fresh ideas for science in the class. Pre-service teachers valued the chance to put theory into practice. A chance to offer a science student interaction with students in my class. An opportunity to allow my students to do science with someone other than me. We went out into schools and taught. It was the biggest learning experience for me... We were a bit sick of theory and wanted to bring it all back and relate it. …It was really valuable to me. Teachers working together with pre-service was seen as a positive for both, and the students in the class, who had more avenues for asking questions, seeking feedback and exploring ideas. Yes. The benefits to my students are what motivated me to be part of the program. Absolutely, team teaching allowed for double the normal amount of student/teacher interaction and meant children had more avenues for asking questions, seeking feedback and exploring ideas. Principals felt that working more closely with the university strengthened the professional ties and it supported the strategic goal of improving science curriculum and teacher competence with science. Schools recognize their responsibility in helping to prepare the next generation of teachers, and the important role that classroom experience plays in linking theory from university with practice. Excellent opportunity to support beginning teachers in their growt and development. I think all teachers should do it, it’s so vital, especially for when we start assessing science. I did it because I had no confidence… I was scared... but the class gave me confidence …The classroom experience was good because it was ok to make mistakes, and be supported to learn. I like the fact that the university and the pre-service teachers are building that relationship, building their knowledge. It’s another school they get to go into, so they visit schools for their formal rounds but it’s another school and a different context and every school’s got a different culture and vibe so it just gives them another look. It’s good for us morally in that we’re involved with teacher education and we enjoy that we’ve got a professional responsibility to that. By working closely together, teacher and pre-service teacher plan the unit. As a result there is also reflection on practice leading to mutual learning, new perspectives, and an opening up of new possibilities for practice. I am learning from her and she is learning from me...mutual learning. It has motivated me to try and keep teaching science in my classroom. Instead of trying to run the whole program myself it gives me a chance to watch and listen to the class and learn about what does and doesn’t work. This learning can then be passed onto the uni student along with solutions to help things run smoothly. In my 3rd year Prac the teacher I had enjoyed teaching science and we did a fair bit of science and it built my confidence. Watching how other people do it gives you confidence. That combined with the unit we did gave me enough confidence. Partnerships develop momentum over time so that the school integrates the opportunities the program into the school’s calendar of events and curriculum program. One of the Deakin schools has initiated a science night that showcases the work the children have completed with the pre-service teachers, and to promote science within the school community. I came to the school in 2008 and it had been going for at least three or four years before my time here and it was something that a lot of people talked about… One of the things that I was really excited about was the fact that the actual tute was running here and then the practical side was done with our children… Even though there may not have been the great follow up to start with, that evolved over time and it actually excited our staff and got our staff talking and thinking about how we can run science in our school, and how we can use the Deakin program to better suit our kids and our curriculum. Over the years it’s evolved into that program still running and then I guess dovetailing into a science evening that we invite Deakin Science students along to help us run and it really showcases the work they’ve done, the work that our children have done, and that our community and the value that it has on science… for me there were a lot of upsides to the actual program. Number one is we had some expertise in the teaching of science, number two it covered our quota on our curriculum for science and, number three it kind of up-skilled our staff on what to do and what to look for and how to run science lessons. “I think there’d be some benefit if there was some sort of feedback or discussion at some point throughout the program that involved the classroom teachers, to talk about what the students were doing what they were observing and then feed that into the classroom teacher and have some discussion." The meaningful experiences exhibited in primary school partner classrooms led to positive conceptions of science within veteran teachers. This increased confidence was and important implication of the partnership impacted: pre-service teachers, veteran teachers and ultimately primary students. When teachers saw they could work with the pre-service teachers and bounce ideas, it provided an opportunity to reflect on their own teaching of science and begin to look for more opportunities to teach science and to develop conceptual learning sequences. It allowed me to reflect upon my own teaching by observing and assisting. It reinforced just how different children learn and how much they rely on their prior knowledge and experience when completing tasks – particularly when predicting and recording observations and results. I use science more frequently in my curriculum now as a way to develop students’ ability to ask questions. Try to plan sequences of linked science lessons, instead of using them as one off sessions. Definitely a change in attitude. I found a fantastic book in our school library full of science activities and sheets ready to go for the children to fill in when they completed the experiment. It also has a teacher section for every experiment explaining what to look for and some guiding questions. I feel confident to take science now because of this book but it was watching James take science with my class that encouraged me to seek out a book such as this. Where schools and universities work together in a way that is valued by both, overtime the programs are more likely to be embedded within the ongoing structures and practices of both institutions. The ongoing partnership associated with the Melbourne University clinical model has resulted in schools depending on and modifying practices. So the partnership has been very important for us and it means that we can develop our units with your guidance and that’s been a very, very important part of our school and university partnership. University staff were uniquely positioned to observe student- teacher growth over the long-term. In this case, a full year involving a traditional science methods class followed by the primary school partnership placement. The time in schools seemed to accelerate student teachers’ understanding of the role and responsibilities of the teaching professional. One of the things I’ve noticed this year is the incredible changes in my uni students from when I first meet them in Science 1 and then how more confident they are at the end of Science 2. I felt like they’d become teachers in a way, they’re much more confident I can see it in their eyes and I see it in the ways they act in class so it’s just a really positive thing and they have lots of positive stuff to say about it. Teachers undertake formal PD or post graduate studies linked to the program. Pre-service teachers develop a science portfolio of the teaching and learning and assessment activities which they use as part of a job applications after graduation. Some pre-service teachers take on science leadership roles in their schools. My pre-service teacher assessed the students at the conclusion of the unit of work. This was most helpful to me as I needed this feedback for my mid-year reporting. It was also a very valuable thing for the pre-service teacher to do as part of her own self- assessment. In my first year out I got given science co-ordinator so I took on a science leadership role and went to network meetings and talked to other teachers… It’s taking me in a direction I didn’t expect. The experience has increased my confidence… Going in and actually teaching science.